Tea Party and they just LOVED it! A Tea Party should be outside, if the weather allows. Our neighborhood has a wonderful collection of nature and life, beautiful birds and butterflies - especially during Spring! 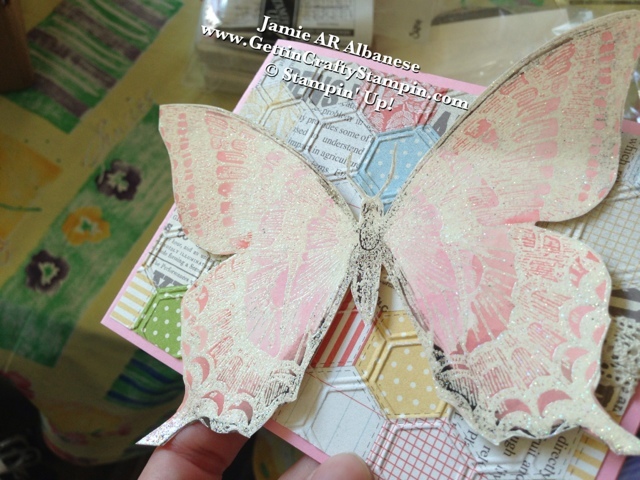 Here is my girly girl card that celebrates Spring! and Big Shot and adhering it to the Pretty In Pink card stock, Spring is ready for a celebration. The Pattern is a Mixed Pattern (very trendy and vintage) and laid out in a Honeycomb pattern. The added Honeycomb texture is a fun way to mimic the style and look. 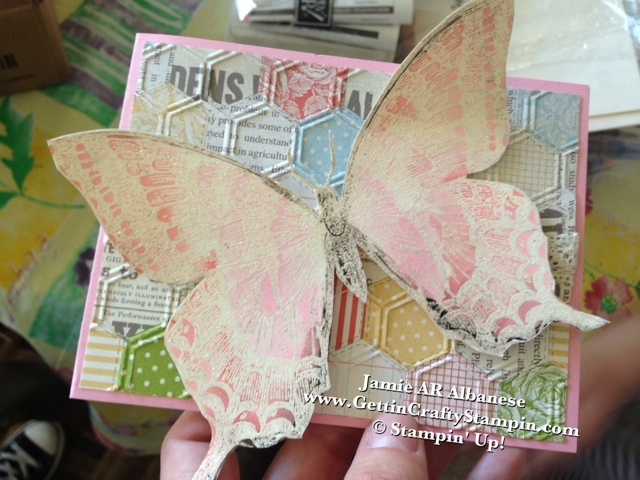 Heat Embossing this Swallowtail background stamp (Spring Mini) on Whisper White with Iridescent Ice embossing powder. Now you have a beautiful sparkly butterfly. With my Aqua Painter, paint the lightest color (Pretty In Pink) and then build up with the next color, Calypso Coral and accent with the Early Espresso for the body and the edges of the wings... this add definition and depth to the pale butterfly. Water Painting is easy and fun! What do YOU like about Spring?!?! Many of us first learned about the butterfly as kids. We studied how a little caterpillar would wind itself up in a cocoon and emerge later with giant colorful wings. This may have prompted some of us to attempt to keep caterpillars as pets, but we all know how that turned out. Oh well. Lesson learned. will read it with my kids today... we'll take a moment to see the many butterflies in our garden (we own a few Butterfly bushes that draw butterflies and humming birds). Celebrate the Little moments in life and have fun with it. Leave me a comment and let me know what YOU like about Spring? What do YOU celebrate? ?